Samsung Galaxy S2 Mini is the smaller version of recently announced mobile phone Samsung Galaxy S2 at MWC 2011. Now the documents containing technical specifications of Samsung Galaxy S2 mini have been leaked out by UK telecom operator Three. 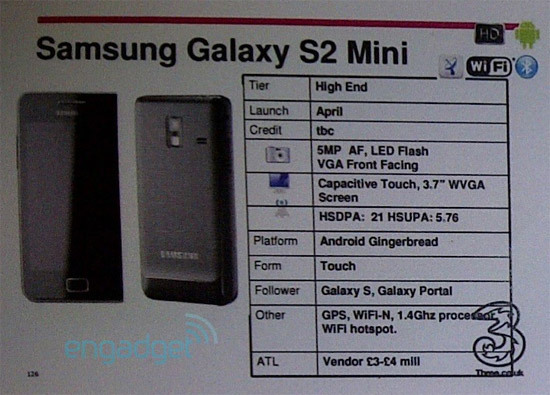 Samsung Galaxy S2 mini will be powered by 1.4 Ghz processor and Android 2.3 Gingerbread operating system. It comes with 5 Mega Pixel auto focus camera with LED flash. It also comes with front facing VGA camera which most of the Samsung handsets are not providing these days. The device has 3.7″ WVGA capacitive touch display screen and features GPS and Wi-Fi. The specifications are not as powerful as Galaxy S2 but these are sufficient for a minified version of a handset. It is expected to launch in April. The spec looks great! Hopefully the price will be cheaper and affordable for me. Haha. Samsung has really improved mobile phone manufacturers since couple of years and it’s trying hard to dominate the industry in India. Yeah, when it’s going to be launch? which date?